He was there again at the same spot on my drive home. Hours and hours after I had stopped and given him what food I had. The same face, same cardboard sign that driver after driver pretended not to see. He seem resigned to this, that he deserved nothing more than their indifference. I think this is what made me cry, this and the thought of his cold hands holding that sign. This is where I remember I am no hero for feeding him, that I am the person who left you to die alone with your hands and face slowly turning cold hours and perhaps days before they found you. 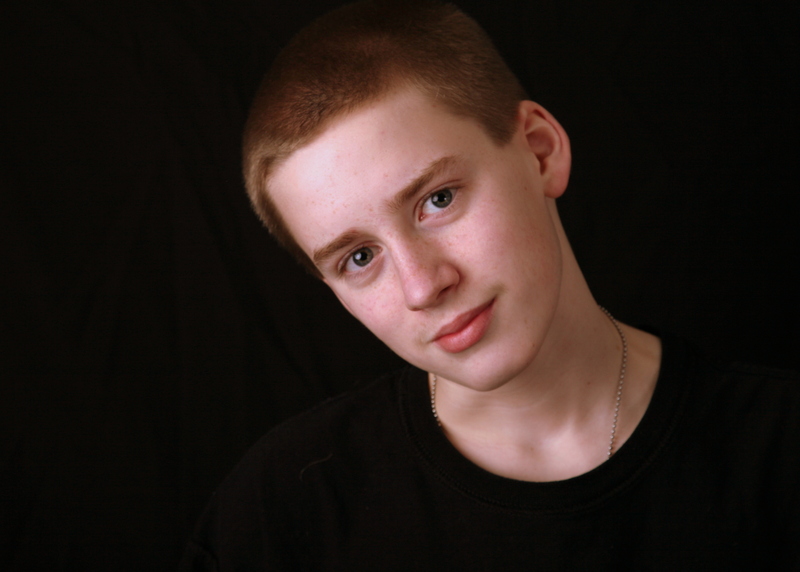 I remember that I let my own son be homeless, left him to the mercy of strangers, let him be cold, alone and resigned to the indifference of others. That once when he came home cold and hungry I gave him a sandwich and a sleeping bag and sent him out again into the cold night. That I spent that night just sitting on the floor because I could find no other way to breathe. I remember other nights sitting against my bedroom door listening to him trying to get into our house, not crying, only breathing. But the sight of this boy tonight, this cold boy, holding his sign, his face believing that he deserved no better, tonight this is more than I can manage. When I see him I also see you, cold, alone and dying. I see my precious boy walking away from his home on a cold night with a stupid sandwich and a sleeping bag and I know that I let all of you down. That I let you die Johnny. That I let my boy be cold and alone and hungry. I don’t ever want to be forgiven for this. And so, I see all your faces together, all your cold hands holding that sign today and it is as raw as the nights I spent sitting on my floor not saving anyone but myself. I don’t what divinity is, only that I saw it in his face today and all I wanted to do was save him, feed him and to beg him to forgive me, but the traffic moved then and I do nothing but drive home and leave him cold and alone holding his small sign. They do not have Congratulations on Your Continued Recovery cards, or at least they don’t have them at Walgreen’s, which is where I go to get items for his care package. I’ve already sent him granola bars, almonds, and a new book from Amazon, but I have to go to Walgreen’s to get cigarettes, cigarettes, some car magazines, a bit of chocolate, and a card. I have a system, first at Walgreen’s painstakingly explaining the cigarettes are not for me, and later at home as I pack and label his bi-monthly box with trinkets and necessities so he knows he’s not forgotten and is still loved. I cry a little each time, sometimes I cry more than a little, sometimes I keep the tears in my eyes all day without them ever falling down my cheeks. My chest feels tight, and I am drawn back into the place where hope and fear co-mingle whenever I stop my busy mind and think just of him. Today it really feels like Spring, and as I carry my reusable shopping bag of cigarettes (because cigarettes or not, I’m still me) into the house, I stop to look at my garden. My front garden has gone from snow to mud in a week, and for days I have been crawling in this mud looking for the first signs of life. 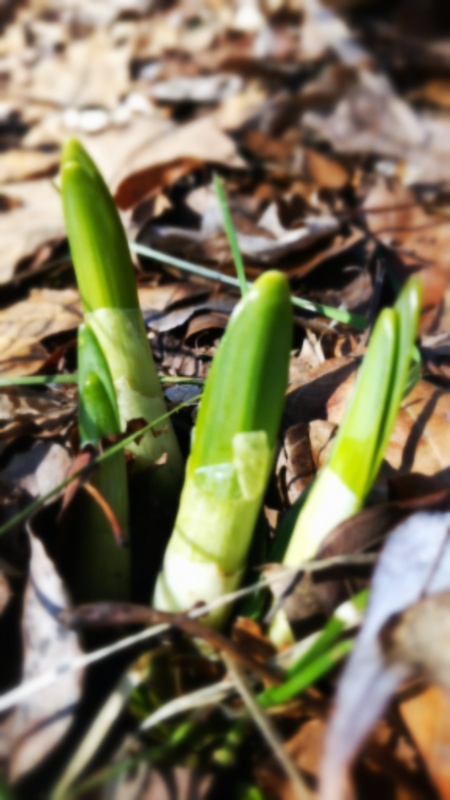 Today the daffodils are breaking through the ground. 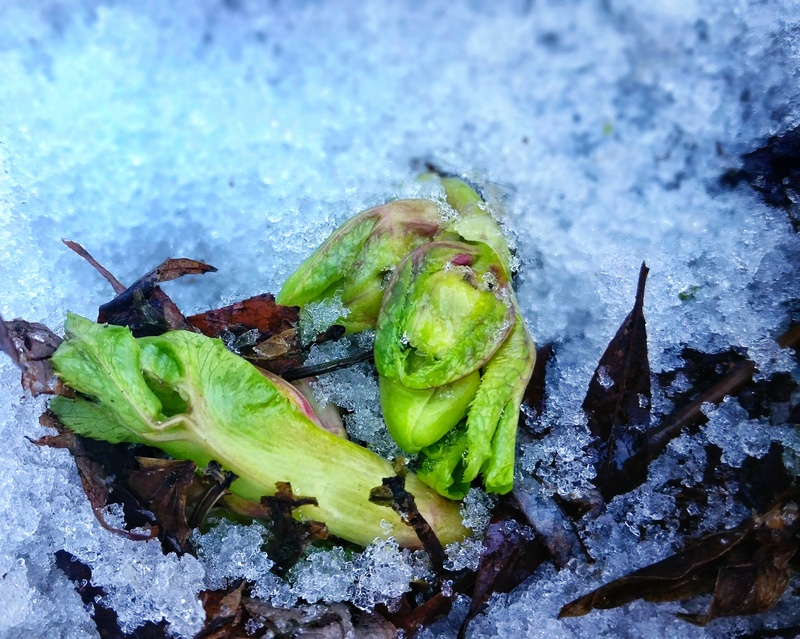 Today I found the first buds of the Lenton Rose under the snow. Today my dog tore through the yard unimpinged by snow, and sent clumps of mud flying in his joyous wake, and today, I stood and listened to the cardinal I’ve named Oberon sing from the still bare maple tree. Today Spring is here. Today you can hear hope in the air, see it the mud, and for moments I feel it in my chest. There is no such thing as victory or defeat; there is only movement, and so we keep moving. As long as there is life, there is hope, and today there is life, today there is hope. There have been other Springs, other hopes, some have lived, many died, but I’ll hold these little bits of it close, at least for today, and maybe when I’m mailing his package this afternoon there won’t be as many tears floating in my eyes, or maybe there’ll be more, but they’ll be the good kind of tears, maybe.